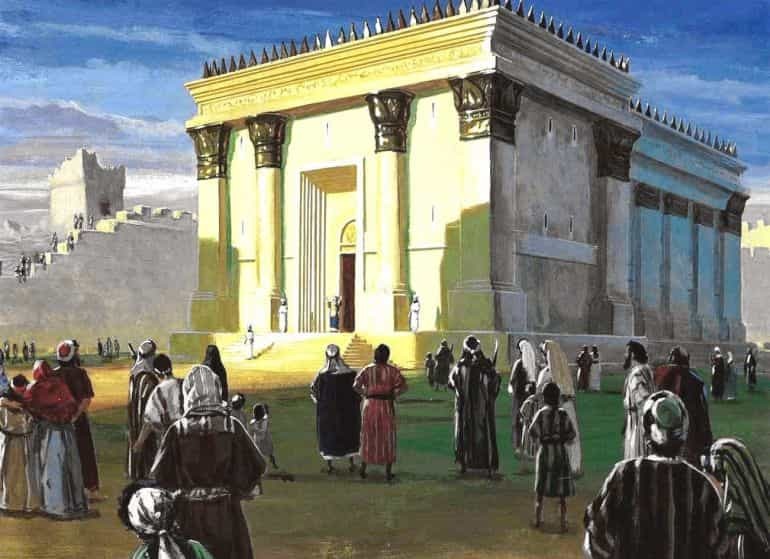 When Was the Second Temple Founded? While our popular notions hark back to the Second Temple of King Herod (circa 1st century BC), Biblical accounts talk about the founding of the Second Temple in the 6th century itself, more than seventy years after the unceremonious destruction of the First Temple (or Solomon’s Temple – see the reconstruction here) by the ancient Neo-Babylonian army in 586 BC. According to such accounts, the second founding was spearheaded by the Jewish exiles who were allowed to return to their homeland following the magnanimous decree of the Persian king Cyrus the Great. While there is no complete description of the Temple built by Zerubbabel, considerable detail can be gleaned from various sources. It had two courtyards. One report suggests dimensions of 500 by 100 cubits (about 750 by 150 ft) for the inner courtyard. There were at least four gates in the wall of the outer courtyard, and at least one of them faced a street. There were at least two gates to the inner courtyard. Various chambers surrounded the Temple in both courtyards. Most of these were in the outer courtyard, and were used for the storage of tithes, equipment, and vessels. Certain high officials apparently merited private chambers within the Temple precincts. Interestingly enough, while the rededication was successfully made with the usual pomp and ceremony, the Second Temple still lacked a few holy objects, including the enigmatic Ark of the Covenant and the sacred fire. And furthermore, the Second Temple also went through its own cycle of foreign interventions. One of these major episodes involved the fledgling Seleucid Empire in 167 AD when Antiochus IV Epiphanes not only sacked and looted the temple but also ordered an altar to Zeus to be erected within the sacred precinct of the Temple Mount. The Seleucid monarch then went on to outlaw the observance of Sabbath and forbade the possession of Jewish scriptures, thus essentially relegating Judaism to a fringe social space. Such harsh measures, in turn, instigated the successful Maccabean Revolt that ultimately allowed the Jewish Hasmonean dynasty to take semi-autonomous control of Judea and Jerusalem. Unsurprisingly, the Second Temple was once again heralded as the center of the Jewish religion and this historical feat is culturally associated with the observance of Hanukkah. 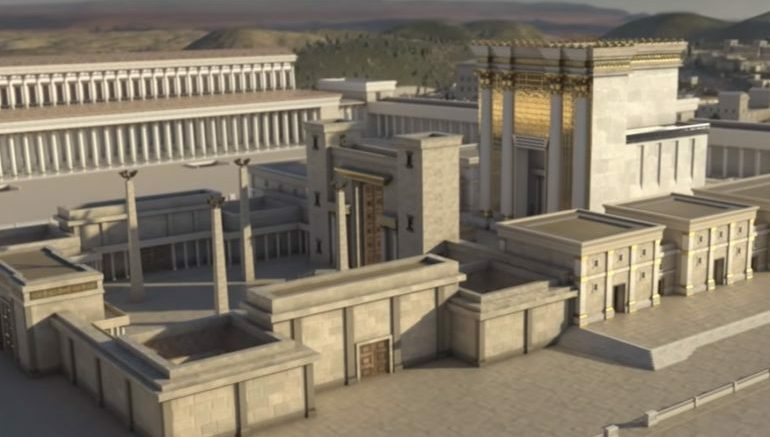 However, beyond just symbolic overtures, the Hasmoneans also played their part in refurbishing many parts of the temple precinct – except for the main structure. In addition to the temple building itself, the temple area (Greek, temenos) consisted of an outer courtyard surrounding the complex; the Court of the Women, which both men and women could enter; and a courtyard that enclosed the altar for burnt offerings. Only male Israelites were permitted in the Court of Israel, a small strip extending along the width of the inner courtyard. Beyond the Court of Israel, only priests were permitted to enter. Inside the temple building were the menorah, table for showbread, incense altar and, further in, the holy of holies. Biblical tradition held that this had been the location of the ark of the covenant in the first temple. The Herod’s temple model by Michael Avi-Yonah. As with any reconstruction of a long destroyed ancient building, especially one as important as Herod’s Temple, many complications surround Michael Avi-Yonah’s model. 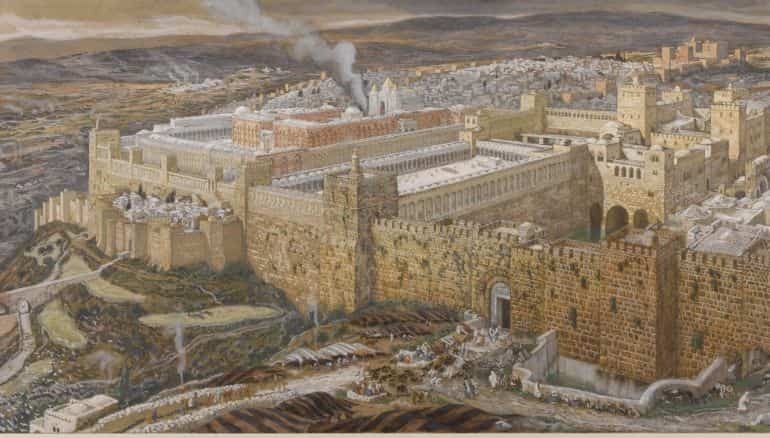 Josephus describes Herod’s Temple extensively in his Jewish War and Antiquities of the Jews, but each description differs slightly, and neither allows for easy architectural reconstruction. Other elements of Josephus’s descriptions, such as the height of the Temple gate doors—which Josephus lists at 49 feet high and 24.5 feet wide—could be exaggerated, as Josephus was wont to do. However, doors of this size were known to exist in the ancient world. Two examples can be found in Rome itself: at the Pantheon and at the Senate House in the Roman Forum. 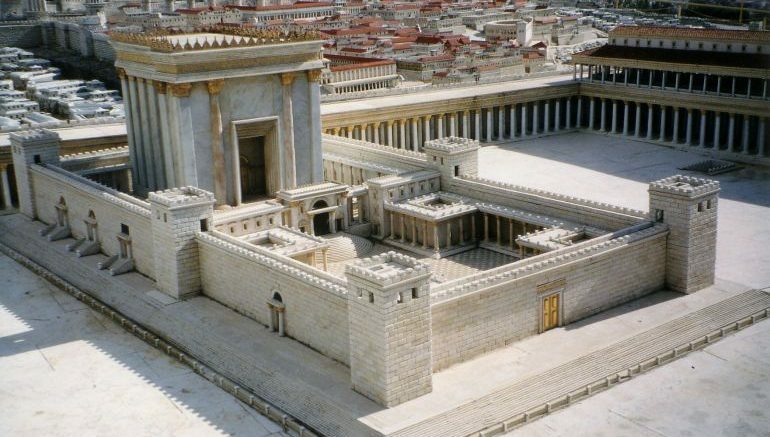 Thus, Avi-Yonah’s model of Herod’s Temple stays true to Josephus’s description. This is but one of the decisions Avi-Yonah had to make concerning his representation of Herod’s Temple. 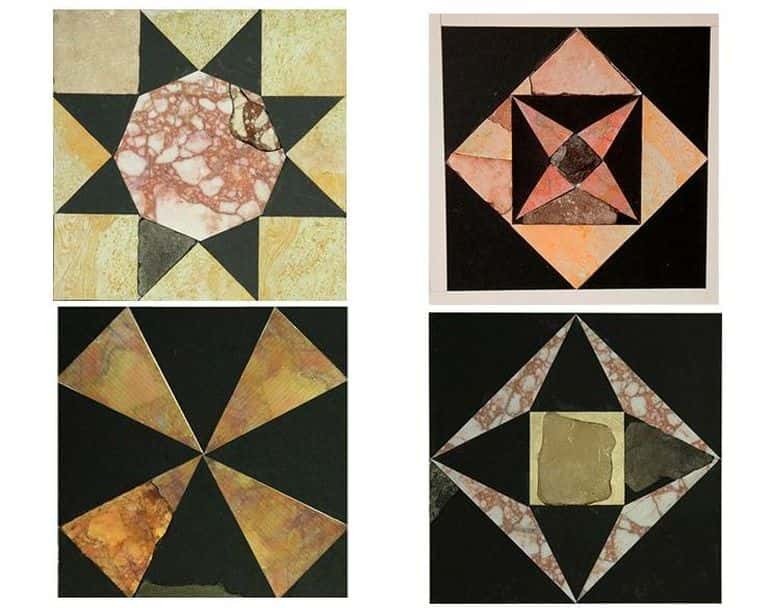 From the archaeological angle, the researchers were able to salvage at least 600 colored tile segments from the proximate areas of the Temple Mount. Among them, around 100 specimens conform to the date of the Second Temple during Herod’s reign. Unsurprisingly, their styles and pattern match with other Herodian architectural feats, including his palaces at Masada and Jericho. Furthermore, many of the segments are also similar to the ones used in the distant palaces and villas that dotted the Mediterranean territories of the ascendant Roman Empire (of the time). The Herodian version of the model shows visitors how excavators believe the Temple Mount site appeared prior to its destruction by Roman troops in the year 70 AD. The focus is on the southern portion of the enclosure, and includes reconstructions of Robinson’s Arch (an early overpass linking the top of the platform with the major city street below), the Hulda Street gates and passages onto the platform, the Royal Stoa, and the Second Temple. The reconstruction is based on the excavations at the Temple Mount under the direction of Ronny Reich and regional archaeologist Gideon Avni.